I am so thrilled to have this opportunity to work with The Home Depot and receive product to make our dream of having an edible organic garden this summer a reality. Go green this spring with the latest organic gardening tools, equipment and supplies. The Home Depot has a large selection of raised garden beds, composters and everything you need for your garden. Check out their expert tips for growing great vegetable and herbs in your raised garden bed. When the opportunity arose to work with The Home Depot Garden Club to #DigIn to spring and get ready for a summer garden, I knew this was right up my alley. Growing my own vegetables and herbs has been a passion of mine since last summer. Last summer we tried a raised garden bed with some mixed success. This year I vowed it would be different, so I was beyond thrilled when I was chosen to grow my own Organic Edible Garden using Bonnie Plants. Growing organic has always been front and center for me when considering a summer garden. I love knowing exactly what is in the food I am preparing and feeding to my family. Growing my own organic vegetable garden means that I have complete control and total knowledge over what I am putting on my dinner table and into my family's bodies. 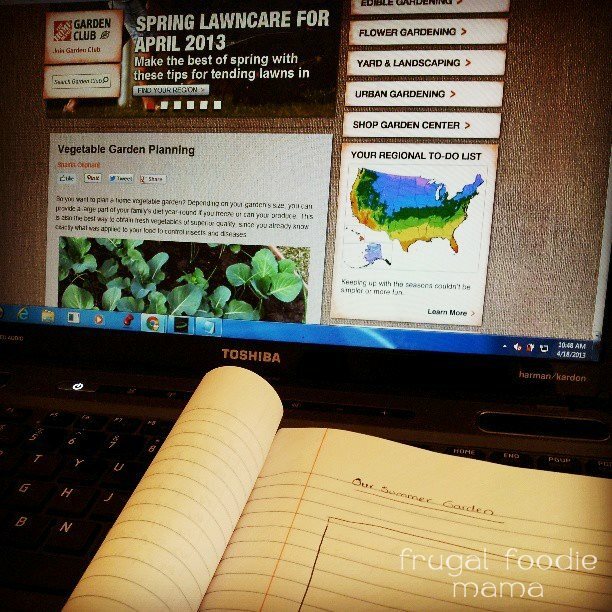 The first step in organic gardening is planning. This is not always easy for me. I get excited, dreaming of the armfuls of beautiful, dirt caked vegetables I will be carrying into my house and then I shortcut the planning to get right to the planting. But good gardening takes planning. The first step in my organic vegetable garden plan? A visit to my local Home Depot to get an idea of what organic vegetable plants were available to me locally. This was strictly a planning visit. We made no purchases during this trip. We walked around, perused the wide selection of Bonnie plants that were available and started making a list of our must-plant veggies and herbs. We also took into consideration which vegetables we could readily buy at our local farmers at an affordable price. We decided against planting corn, zucchini, and summer squash because all of these take up considerable space in a garden, and we knew we could purchase these for relatively cheap from local vendors and farmers each weekend at the market. The next step in our organic vegetable garden planning was surveying our space. We knew we had plenty of space available to us for our garden this summer. The question was just how big of a garden would we want to have to create and maintain. We settled on this square of space that was used by previous owners in years before. It has some partial shade in the late afternoon, so this part of the plot would be the perfect spot for planting our lettuces that can't take a full day of direct sunlight. I plan to find a box planter that we can hang here to grow my herbs in. I prefer to have the herbs in close proximity to the door leading off from the kitchen so I can run out & grab a few snips or leaves as I am cooking. Step #3 in planning our organic vegetable garden was online research. And lots of it. Where did I head first? They have an entire section dedicated to just Edible Gardening. You can find anything and everything you could possibly want to know about growing your own organic edible garden there. I found the post on Vegetable Garden Planning especially useful. I researched the vegetable plants we had decided on during our planning visit to the Home Depot. I found out how much direct sunlight they would need, how many inches apart they should be planted, which vegetables should be grown near each other & which ones should not. I did a little research on what we need to do to make sure that our soil is organic vegetable planting ready. I also may have spent a considerable amount of time perusing The Home Depot's Garden Club Pinterest board, finding inspiration and repinning those projects and ideas that I really want to try for myself. After all the online research, this is the rough draft of the plan that we have for our summer organic vegetable garden. One of my favorite things that we are going to try is to build a trellis for the cucumbers so that they do not take over the entire garden. I am looking forward to our actual shopping trip at The Home Depot so we can ask for some expert advice on how to go about building one. How about you? Are you attempting an organic vegetable garden this year as well? What have you done to plan for it? I'd love to have a garden one of these days. We kind of need a house first, haha! We're not starting a vegetable garden this year, but we are planting an herb garden. I can't wait!